I am aiming to publish this article. Therefore, I’ve taken the majority of this article down. If you read this entry, keep in mind it may “sound” choppy due to eliminating the majority of my argument. I am wanting to maintain my introduction and conclusions for multiple reasons. First, I’d like to whet the appetite of those engaging eschatological language, persecution, and biblical theology. Second, for those desiring to pursue kingdom of God studies or sources for the Thessalonian epistles, I’ve maintained by bibliography to assist those researching. Finally, I desire readership and limiting the paper to the introduction and conclusion makes readership more feasible. Some elements of the future eschaton are making headway into the present era. Evaluating modern consensus, eschatology reveals hermeneutical and theological presuppositions in attempting to describe the already/not-yet tension. Problematic to the discussion resides in determining what elements are future and what elements are present. Are some elements fulfilled now, implying no substantial change/modification will happen later? Furthermore, if nascent elements appear now, is there progressive development throughout the present era, if any? Matthew’s idiolectic use of Kingdom of Heaven has perplexed the multitudes. With Kingdom appearing 162 times in the entire New Testament, it appears 126 times in the Gospels. Moreover, Kingdom appears 55 times in Matthew; yet, only 5 times with the genitive God (Kingdom of God) and 32 times with heaven (Kingdom of Heaven). Jonathan Pennington, in Heaven and Earth in the Gospel of Matthew, provides a superb analysis by providing solutions to this data. Pennington’s thesis is multi-layered. 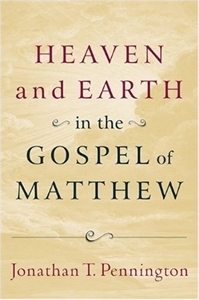 Seeking to uncover the relationship between heaven and earth in Matthew, Pennington’s discussion begins with a deconstruction of Matthean presuppositions over the past 100 years concerning the reverential circumlocution. The Jewish nature of Matthew has led some to observe the reverential Jewish assumption of substituting other words for God and, consequently, conclude that Matthew exchanges Kingdom of God with Kingdom of Heaven. Pennington’s deconstruction is quite convincing by demonstrating Dalman’s (The Words of Jesus, 1902) scholarship to contain inconsistencies based on a faulty methodology, and, at not fault to Dalman, an inability to examine all the 2nd Temple intertestamental literature. Pennington proceeds to examine the evidence from OT, LXX, Qumran, Psuedipigrapha, and the New Testament literature. His conclusions, though, don’t fully negate the idea of circumlocution, but he does provide enough data to conclude this is not the prevailing or dominant pattern in Jewish literature. Furthermore, Matthew uses Kingdom of God, heaven is used in the singular and plural, and, thusly, the combined effort of these three items argue against a reverential circumlocution. (Keep in mind, Pennington’s argument is more developed). A cosmological duality may provide a better answer for Matthew’s use of Heaven and Earth.